Home > News > > There’s Been An Incident, Now What? This page is a curated list of resources to help you with incident investigations, reporting and returning to work. Employers are responsible for investigating certain incidents or near misses that take place in the workplace and submitting an investigation report to WorkSafeBC. These investigations help employers and WorkSafeBC determine why an incident happened and what can be done to prevent similar situations in the future. 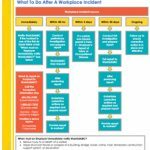 Our flowchart will show you what to do after a workplace incident has occurred. For information on incidents requiring investigation, investigation stages, reports, the reporting process and how to submit a report to WorkSafeBC, head to the WorkSafeBC resource Conducting an Employer Investigation. The Reference Guide for Employer Incident Investigations is intended for those who conduct or participate in workplace incident investigations: employers, joint health and safety committee members, worker representatives and others. It will help you effectively prepare to investigate an incident at your workplace. WorkSafeBC has developed an employer incident investigation report (EIIR) template you can use to create all four reports that may be required following an incident in your workplace. This template will help you collect all the necessary information and reduce the work associated with completing multiple, separate reports. Actsafe is dedicated to helping employers develop return to work (RTW) and stay at work programs. If you’re an employer interested in creating a RTW program, or are simply interested in learning more, Actsafe have compiled a list of resources from WorkSafeBC to review and consider below. Or, why not give our industry advisor a call for guidance on (604)733-4682. Recovering while at work is the healthiest option for most people with work-related injuries. Working is good for physical and mental health, and often helps speed healing. Making safe, sustainable work arrangements for recovering workers takes teamwork. Workers, employers, and health care providers all have important contributions to make. Read more here. You may also like to create an Employer account on the WorkSafeBC website here. Creating an account is the first step toward accessing their online services. That way, you can view information about any claims you might have, as well as your WorkSafeBC account, if you have one. Canadian insurance providers, Great West Life, have information on workplace strategies for mental health here. The CSA site also has information on mental health here. 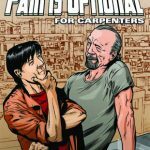 Curtis Weber was injured at work when he was 17 years old. In this video, created in partnership with WorkSafe Saskatchewan, Curtis, his family, and his friends tell his story of recovery and return to work. For more RTW videos, you can find WorkSafeBC’s selection here.